How to speed up people related decisions? Home » How to speed up people related decisions? » Blog » How to speed up people related decisions? Senior executives increasingly worry about how long it can take for making important people related decisions at their firm. On the other hand, managers think that if they speed up decision-making without adequate reflection, they may take the wrong. This can create challenges since the business environment is changing very rapidly. With innovative use of modern HR technology, managers can speed-up people related decision making and quickly meet the evolving needs of their businesses. The core functions of HR are useful in augmenting the capacity of existing workforce through well-defined processes, while complying with statutory requirements. Each of these processes may include a set of business objectives. Sometimes, there may be issues in meeting those objectives. HR managers can use analytics to dig into the issues surrounding each process and identify what needs to be done to offer an excellent experience to all employees. Analytics has become pivotal in decision making because modern workers are mobile, contingent and autonomous, and as a result, harder to manage and engage. Companies need actionable insight at the right time (rather in real-time) to deal with such workforce and only analytics tools can offer required insights. You can read our last blog post to learn how HR analytics can help speed up your HR processes and transform the way of hiring, developing and managing people. If your business is considering an Applicant Tracking System (ATS), the system can greatly offset its cost by significant savings on overall recruitment costs and time. Sifting through a high volume of CVs for each job posting usually takes a full week of work. However, a modern ATS automatically selects the most qualified CVs and leave you with a significantly smaller number of CVs to evaluate. Further, the automation of the interview, test and offer processes can streamline the entire operation shaving off countless man-hours spent in coordination activities between the different stakeholders. In nutshell, the time savings from the modern ATS automation alone can more than make up for the cost of investing in the software. According to 2015 Talent Shortage Survey by the Manpower Group, the TALENT SHORTAGE in 2015 had peaked at a seven-year high of 38%. This shortage may increase further as companies are not offering enough opportunities for employees to grow professionally, according to 2015 Employee Engagement Report, published by TINYpulse. To deal with this situation, companies may encourage the idea of “career partnerships” with employees that are of value to both. Employees should be shown how to develop the skills the firm wants them to have. In addition, instead of using passive channels like internal job-boards, HR managers may directly approach to the right employees for the right positions (full-time or project-based) and allow employees to shift between teams. This keeps employees engaged and provides managers with the right skills at the right time. With this approach, companies can save significant amount of talent management time and also increase employee satisfaction. Non-traditional workforce includes millennials and Gen-Z because unlike baby boomers, they value flexibility in working hours and workplace. As we know that millennials will account for 75 percent of the global workforce by 2025, HR managers should right away start tapping this talent pool and prepare a pipeline of ‘future ready’ workforce. Read our last blog post to learn how prudently HR managers can use modern recruitment software and employee referral program, and tap this new pool of non-traditional workforce in minimum time. It takes companies an average of 52 days to fill open positions and the average talent acquisition cost is nearly USD 4,000,” according to Talent Acquisition Factbook 2015 by Bersin. As an HR technology solutions provider, we internally analyzed this issues and observed that lack of automated processes, red tape and protocols unnecessarily delay HR processes. Modern HR technology ensures speedy HR decisions by the removal of many obstacles that are introduced because of paper based processes. 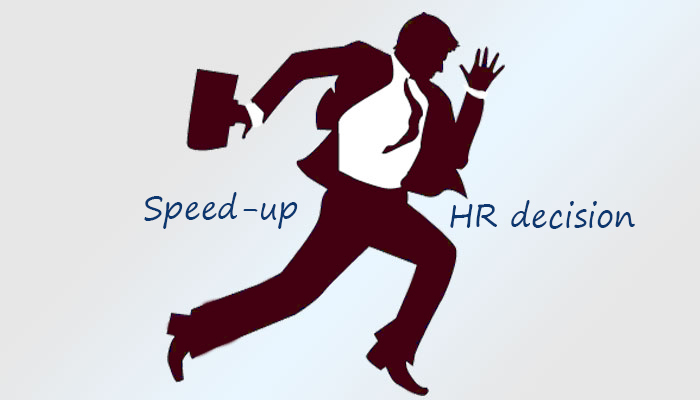 Slow HR workflows introduce risks of talent loss, productivity loss and consequent impact on business survival. With decades of experience, we can say with confidence that the increased time spent on refining HR processes alone would not yield significantly impactful results. It is prudent to invest in modern HR Technology, analytics and automated HR processes in your organization as well.